Holy Cow! This was strange. I got the SMOK Veneno handed to me at work, and I started to do an unboxing, doing some research, and when I got ready to start my review, I had nothing to say. I was completely blocked. And it clicked perfectly. Eureka! That’s what I was thinking looking over the SMOK mod in my hand, and reading up on it spec sheets; I was looking for the distinguishing features of this mod; what sets it apart. And I couldn’t find it. What I did find were the things that you usually did on a 225W box mod. First off, that it is a 225W device means it’ll have two removable 18650 batteries, right? Right. Two removable 18650 batteries also mean that it is perfect for sub-ohm coils, of which the Veneno has two, check? Check. So everything you pretty much expect to find on a contemporary sub-ohm, 225W box mod you’ll see on the Veneno. That and lots and lots of LED lights; so many flashing LED lights you’ll think you are in a Thai red-light district. Shop SMOK Veneno Directly HERE! So I, more or less, already gave you an inkling of what I thought about the first time I saw the SMOK Veneno 225W. But I’ll keep an open mind and take you through the basics, and also try to be more objective. The first thing that comes to mind about the SMOK Veneno is COLOR! Lots and lots of color. The Veneno, as is customary with SMOK, comes in seven different color combinations, one of them resembling the Iron Man armor. On the front, you have an OLED screen similar in size to the ProColor, and most all of SMOK’s box mod devices. OLED displays have become something of a strong suit for SMOK since they make them big and bright and easily navigable. And this screen is no exception. The Veneno has a side firing bar, on the wrong side, I would say unless you are left-handed. Holding the Veneno as is with your right hand would mean pressing (or trying to touch) the firing button with the space in between your thumb and index finger or with your thumb. Holding it in your left hand would solve that problem, but then again would feel awkward if you are a natural righty. But I guess putting the firing bar on the other side would have made the lefties throw up their hands in revolt. So, let’s just say that the placement of the firing bar feels a little off. Moving on, the other buttons on the mod are the two selector buttons located underneath the OLED screen and grouped in a V formation. There are also two V-shaped LED lights that separate the buttons from the display and the USB port, at the very bottom, from the selector buttons. On the back of the mod is where things get bright. Unlike Vaporesso, which had the class and imagination actually to make the LED lights look like something, SMOK took the opposite road and just slapped some more V-shaped LED lights on the back, because YEAH! They are supposed to resemble racing stripes, and I guess they achieve their purpose, if not anything else. The bottom loading batteries get placed into the device by flipping the little switch to open the battery door. Even more evidence of the SMOK Veneno’s questionable existence is its conspicuous lack of customary vaping outputs, like Bypass mode and TCR mode. But for this decision, I must applaud the good people at SMOKTech. I heard the death knell for TCR and even temperature control a long time ago, and as for bypass mod, just go out and get a mech mod if that’s how you want to vape. It’s about time a manufacturer picked up on what’s in the hearts and minds of their customers. There are only three vaping outputs available on the Veneno 225W, variable wattage, temperature control, and variable voltage and memory mode. You turn the device on by clicking the firing button five times, and that takes you to the primary screen display that shows you all your relevant vaping information like wattage, coil resistance, and voltage. However, to the detriment of SMOKTech and their customers, there are an innumerable amount of ways that you can customize the LED lights on the Veneno, which is a little counter-intuitive and further asks the question, why is the SMOK Veneno important? I haven’t said much about the TFV8 Big Baby tank in this review only because I’ve used it a countless amount of times with different SMOK devices. I love the Q2 quadruple coil; it works wonderfully, and the same goes for the Big Baby. But, unfortunately, this kit does not come with the capacity extending bubble tank that takes a 5ml capacity tank to an 8 ml capacity tank. That was a bad move, SMOKTech. The tank extender would’ve added exponentially to this kit, but making us buy the bubble tank separately was not the way to go. With only three vaping modes on the Veneno, there’s not much to say about how the SMOK vapes. I used the pre-installed Q2 coil, at close to its maximum power output of 80W. I got great tasting clouds, and a full, thick cloud structure. And that was entirely satisfactory. I didn’t feel the need to keep going higher or get more significant clouds. But anyway, I still swapped out the Q2 for the octuple coiled T8, just for a little more cloud density. I took the SMOK Veneno right to 100W and vaped away. I had the airflow slots semi-closed, and that led to some wonderfully thick cloud streams. The draw was quite effortless, and the taste was spot-on; another satisfied vape from the T8 coil. I wasn’t going to make the same mistake that I usually make and compare the SMOK Veneno to another SMOK device, so I decided to pick up an old favorite and see how it stands up to this new entry from SMOK, the Joyetech Cuboid Pro. The Cuboid Pro has a very bright and interactive touchscreen as its main feature, but it also performed remarkably well with the included ProCore Aries tank. The Cuboid Pro could even get to high-wattage outputs with its maximum being 200W. This is not boding well for the SMOK Veneno. The Cuboid Pro was an amalgam of old and new, of analog and digital; it took a step in a new direction, it had ambition. The SMOK Veneno has seven similarly shaped LED lights, and that’s it. There’s no direction, no raison d’etre. And although I didn’t mind that the Veneno kept it simple regarding vaping outputs, the Cuboid Pro also only had three modes, so that was one place where the Veneno could have had the edge over the Cuboid Pro. Too bad, SMOK Veneno, even though you were designed after a sports car, looks like you lose this race. The SMOK Veneno didn’t come overloaded. Apart from the cavalcade of lights that make you feel like you are walking into a Third World house of ill repute, the SMOK Veneno is still a pretty tight package and lent itself to easy portability. With its stripped-down interior, the SMOK Veneno only had a simplicity to offer, and it was happy to deliver just that. This was yet another thing that the SMOK Veneno could handily offer to its user, a more than satisfactory vaping experience. And it did, thanks to the coils and tank combination. I’m not one for gaudy, unnecessary displays of light. The Vaporesso Revenger Mini and the Vaporesso Transformer displayed LED lights tastefully, with a little bit of cohesion and sense. But SMOK went the other way and just slapped some lights onto its mod. I have to say, wrapping up this review, I was struck by a little admiration for the SMOK Veneno. A few reviews back, I lambasted dull, colorless, box mods that took themselves too seriously. And now, here is the antidote to all that seriousness, and I’m still not happy with it. So I appreciate the heart and joie de vivre that SMOK puts into their devices. There is not anything to not like about the SMOK Veneno. It works well enough; it produces excellent tasting vapor, the coils are superior, so there’s nothing to complain about. But it just lacked something special, something that put it over all the others. I give the SMOK Veneno 225W kit an 8/10. 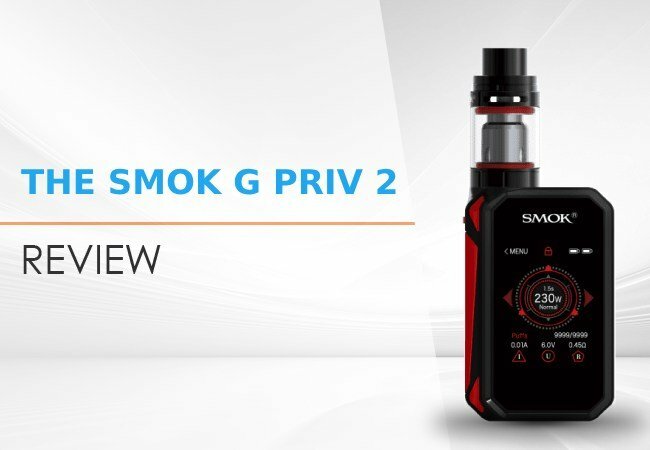 The SMOK G PRIV 2 is a dual-18650 mod with a 2inch OLED, high-resolution touchscreen and a max power output of 230W. The SMOK G80 TC box mod is a new entry from SMOKTech that has a mid-range power output at 80W and a Spirals style coil system. Read our review here.